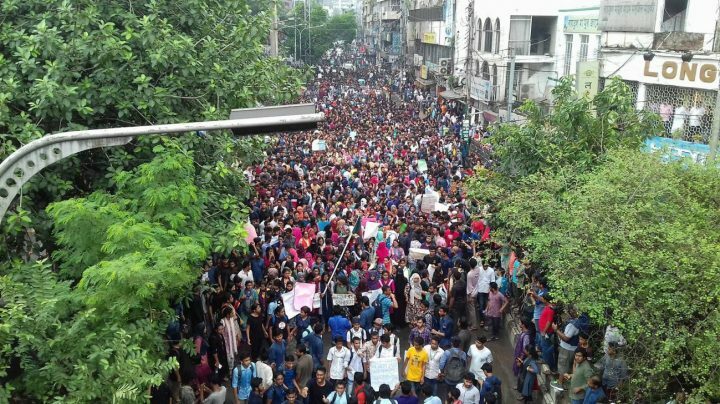 Bangladeshi students take to the streets to protest road accidents and lack of safety. Bangladesh. Since July 30, students of different educational institutions have been demonstrating on the streets, asking for justice. On July 29, two students died in a road accident at the airport road. The incident pushed the student community to go out in the streets with a nine-point charter of demands for the authorities to meet. For the sake of road safety and justice, the students are demanding that there should be a speed breaker in front of every school and college, and that each accident should be investigated, with the persons responsible brought to justice. Driving licenses, route permits for vehicles, enforcing the no changing of lanes, having a designated emergency lane for ambulances and the need to use footbridges and pavements; in sum, to strictly enforce existing traffic rules and regulations are some of the demands of the student protesters. But it seems the whole traffic system has been corrupted and there has been no solutions given. The current scenario is now different. Some people have become afraid of this demonstration of student power. In last few days, they are forcing the students to stop their protest actions, using hand knives and even bullets, notwithstanding that the protesters are young students 14 to 18 years of age. The question is, are there solutions or not? Is the use of force the only solution or can their demands be fulfilled? Because they are our children, their demands are our demands. Anyone can be caught in these kinds of situations at any time. Why are the students being stopped and why are we allowing our students to die on the roads? Where is our humanity? We cry for these students just as we cry for the Rohinga refugees. Their children and now our children are dying and we are just watching, allowing these situations to happen!! Let us remember, they are small bangobondhu (referring to the founding father of the Bangladesh Republic) and the students have learnt from his example never let injustice go unheeded. “Jodi Tumi voy pao, Tobe Tumi sesh, Jodi Tumi rukhe darao, Tobe tumi Bangladesh”!! These statements are on the banners of these young protesters. In English, ” If you become afraid, you are finished. If you protest, you will win (you will become Bangladesh). We want to become bangobondhu, to become Bangladesh.